Foundation stone 28 Oct 1899 by G W Cooper, architects Williams & Goode, limestone with brick dressings, closed 26 Jul 1959. 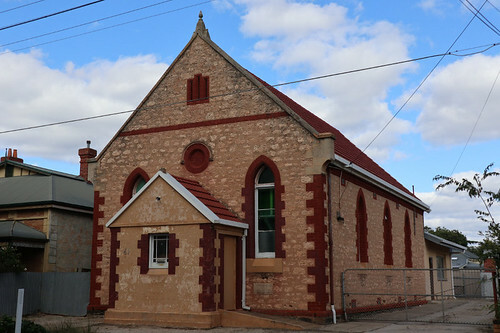 First church, wooden, opened Oct 1883 on same site in Pulsford St. Third church opened Aug 1959 in Milner St, Sunday school opened Oct 1960. When the Milner St church became too small, the former St Cuthbert’s War Memorial Hall in Gloucester St was purchased & re-opened as Baptist church 1988, last service 1996, sold, demolished & replaced by houses. The Milner St church was also demolished & replaced by houses. Foundation stone 20 Nov 1920 by Governor Sir Archibald Weigall, opened 22 Aug 1921 in Gloucester St, sold to Baptists 1988, last service 1996, sold, demolished & replaced by houses.